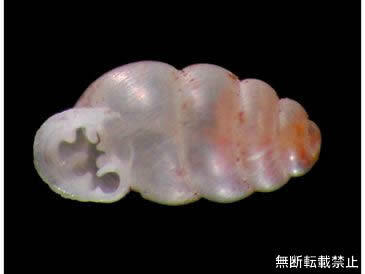 Gastrocopta armigerella, from Okinawa in Japan. Photo by Hiroshi Ishikawa. Gastrocopta is a genus of terrestrial snail found pretty much throughout the world, mostly in drier habitats. Despite its abundance, it is not hugely familiar to most people by virtue of the fact that most species are only a couple of millimetres in size. Shells of Gastrocopta species are whitish and somewhat translucent, and have a number of distinct projections around the shell aperture. These projections may function for protection or they may help to reduce water loss: both important functions for a tiny snail. 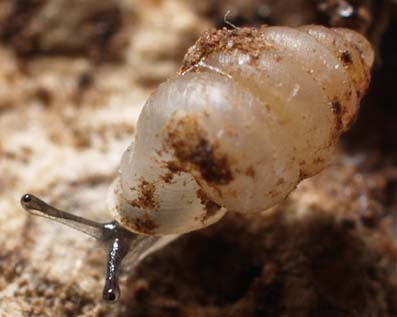 Gastrocopta is a member of the superfamily Pupilloidea. All pupilloids are small, cylindrical snails, and authors have differed significantly as to how the group is divided up: some authors have recognised only a single family Pupillidae, others have recognised a number of families. The classification of Bouchet et al. (2005) (which is as good a baseline as any) includes the subfamily Gastrocoptinae in the family Vertiginidae. As well as the cosmopolitan Gastrocopta, Gastrocoptinae includes a number of genera with more restricted distributions (Pokryszko, 1996). The relationships between these genera do not appear to have been studied in detail; while I haven't found an explicit statement of such, there seems to be something of an implied suspicion that Gastrocopta in its current sense may represent a plesiomorphic paraphylum to at least some of the other gastrocoptines. Live specimen of Gastrocopta contracta. Photo by Aydin Örstan. There is certainly no shortage of described species for Gastrocopta, with probably at least as many species waiting to be described. However, the taxonomy of this genus is not on the firmest of grounds. Soft-anatomy characters such as genitalic features have been little studied within Gastrocopta, and have generally not shown much variation when they have been studied (Pokryszko, 1996). As such, species are distinguished by features of the shell, particularly the arrangement of teeth around the aperture. Unfortunately, at least some species have been shown to vary between individuals in these features, making species identification potentially difficult without access to multiple specimens (of course, Gastrocopta is hardly exceptional in this regard). Also, while the genus has been divided between a number of subgenera, the boundaries between these subgroups tend to be somewhat blurry and not all authors have accepted their validity. Pokryszko, B. M. 1996. The Gastrocoptinae of Australia (Gastropoda: Pulmonata: Pupilloidea): systematics, distribution and origin. Invertebrate Taxonomy 10: 1085-1150.